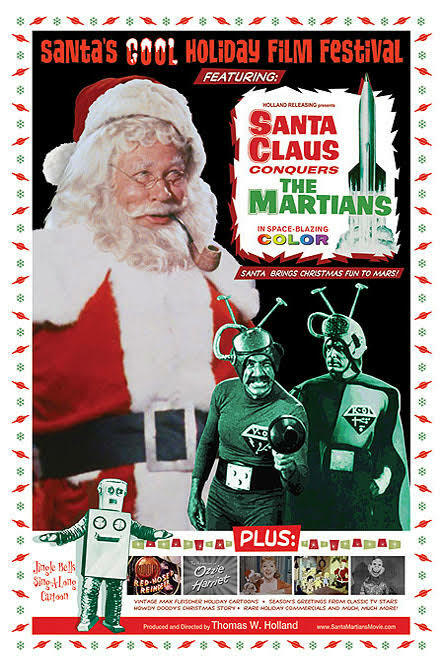 Movie: "Santa Claus Conquers the Martians"
When the Martian leader notices something wrong with the children of his home planet, upon the advice of the Ancient One, he leads a mission to Earth to bring Santa Claus to Mars in order to make the children of Mars have a happy childhood. Yes, this movie exists. Most people who are familiar with "Santa Claus Conquers the Martians" most likely became aware of it after it was subjected to some riffing for an episode of "Mystery Science Theater 3000" back in the late 1980's. For the sake of this review, we watched this film in its original glory, without the aid of commentary from Crow, Tom Servo, and Joel. The film is directed by Nicholas Webster and is written by Glenville Mareth, based on a story by Paul L. Jacobson, both of whom only have this writing credit to their name. It stars John Call as Santa Claus, who is captured and taken to Mars so he can bring joy to the unhappy children who reside there. Martian children are never really afforded a childhood, and now, it's up to Santa to let them experience what it's like to be a kid. The majority of the cast consisted of relatively unknown actors, though it does feature Bill McCutcheon, who would have a small role in "Steel Magnolias" and a reoccurring appearance on "Sesame Street" as Uncle Wally. Also in the film playing a Martian child named Girmar is Pia Zadora, who would eventually have the honor of winning a Golden Globe and a Golden Raspberry for the same performance in the 1982 film "Butterfly." "Santa Claus Conquers the Martians" is a really low budget, cheesy sci-fi Christmas kids movie. Costumes involve snorkel masks painted green and mounted upside-down on helmets, a copper gas line, some green tights, a couple of radio antennas, and a Whammo air blaster as the martian's weapon of choice. This movie is ridiculous from top to bottom, including a poorly written script and dialogue, a heavy reliance on and overuse of military stock footage, and mediocre acting, though John Call is really giving his performance as Santa his all and seems to be enjoying himself. From an acting, directing, story, and character standpoint, "Santa Claus Conquers the Martians" is a bad movie. That being said, there is a little bit of joy to be found in how absurdly bad it is. It is probably a much better choice to let the MST3K guys help in aiding the outrageous comedy of it all. It would certainly make it a more tolerable experience. In the end, it is probably best to avoid this film in its original form.